Martina Pötschke-Langer, MD, from the German Cancer Research Center, Heidelberg, Germany, discusses strategies to improve tobacco control in central European countries. The role of the doctors, especially of oncologists, is crucial as their voice will be heard. When doctors are intervening in tobacco prevention and control programmes of their governments, politicians are more likely to get involved and act. However, this is sometimes difficult if doctors are not so used to the right argument, especially on the level of tobacco control measures, for example, legislations and so on. Regardless, the overall goal is very clear, to reduce the smoking rate in our countries. As an oncologist, the daily problem is with patients who continue to smoke. Dr. Pötschke-Langer emphasizes that doctors work on the political level for the benefit of their patients. 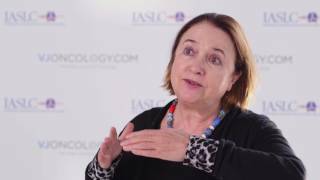 Recorded at the 2016 World Congress of Lung Cancer (WCLC) of the International Association for the Study of Lung Cancer (IASLC) in Vienna, Austria.